CALLING ALL BERGEN COUNTY BOSSBABES! 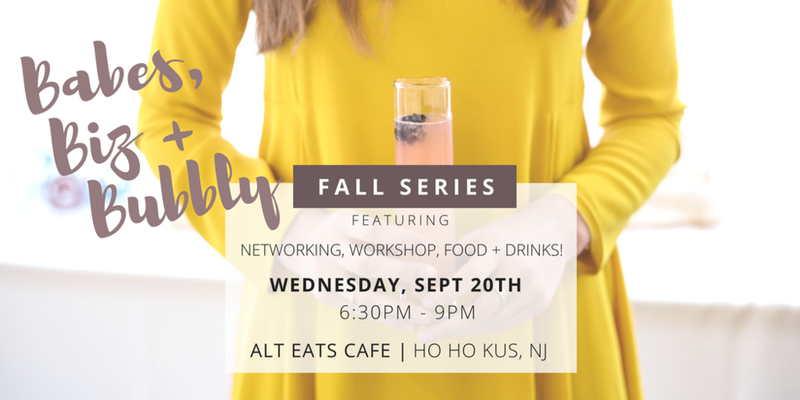 Join us for an intimate networking as we step into fall on Wednesday, September 20th at Alt Eats Cafe in Ho Ho Kus! This event was brought to life to create a high-end space for female go-getters (like you!) to connect, grow + support one another! Whether you are a side-hustler, just getting your business off the ground or a seasoned entrepreneur, having a network of badass babes behind you is something we all benefit from! Meet up with other like-minded babes + learn key takeaways on upleveling your life + biz. Hosted by Lifestyle + Wellness Coach, Kendall Marie Zoppa. Tickets are limited and include passed hors d’oeuvres , bubbly + giveaways!